The guest service manager of a hotel is responsible for running front-of-the-house tasks. Their particular focus is on the customer, including ensuring guests have everything necessary to enjoy their stay at the hotel. The manager is also responsible for employees who working in customer-facing positions throughout the hotel, as well as ensuring that guests have overall positive experiences. The attached printable job description provides a good overview of duties common to this type of position, though specific responsibilities and requirements vary from one job to another. 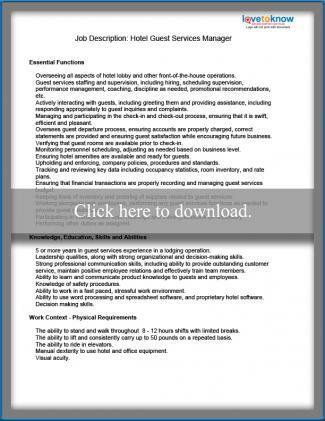 Download a hotel guest services manager job description. Once you have downloaded the job description, you can review the document on the screen, print it, make changes to it and/or save it. You can edit the text by clicking in any of the lines of text and making changes using your keyboard. You can access print and save commands through the "File" menu or by clicking the printer or diskette button, respectively, on the tool bar. Job descriptions are position and company-specific, and many factors can impact exact requirements. For example, hotel size, the organizational chart and the company's branding strategy can all have a significant impact on duties and expectations. As you review the printable job description, keep in mind that this document is just one example of what might be necessary for this type of positions. While there are certainly similarities among guest service manager jobs in hotels, chances are that no two companies use the exact job description.